With Airtel, enjoy incredible picture quality from the comfort of your home. Be it a famous cricket match highlight or your favourite movie, get access to a never-before visual experience. 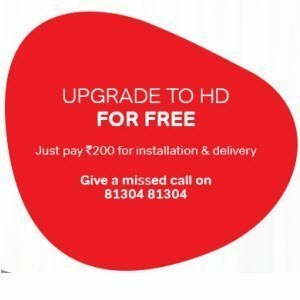 Upgrade to HD for free! Just pay 200 for installation & delivery. To avail the offer, give a missed call on 81304 81304. Airtel reprentative will call you back for further details.